Day one of a six-and-a-half-year project to become a Real Madrid star – Brahim Diaz has trained with his new team-mates for the first time. Diaz completed a £22million move from Manchester City to the Bernabeu on Monday, and on Tuesday was put through his paces at Real’s Valdebebas facility. He made the switch after being limited to just 414 minutes of senior football at City since joining from Malaga in 2013 aged 14, including 49 minutes of Premier League action. However Real clearly regard the 19-year-old as a huge potential talent, and he was immediately involved with the first team after his big-money move. The new Real No 21, who will earn £60,000 per week, said he has no doubts after swapping one European heavyweight for another, despite the likely lack of first-team chances in the short term. Diaz will take inspiration from another teenage attacker, 18-year-old Vinicius Junior, who has made an impact on the Real first team this season. 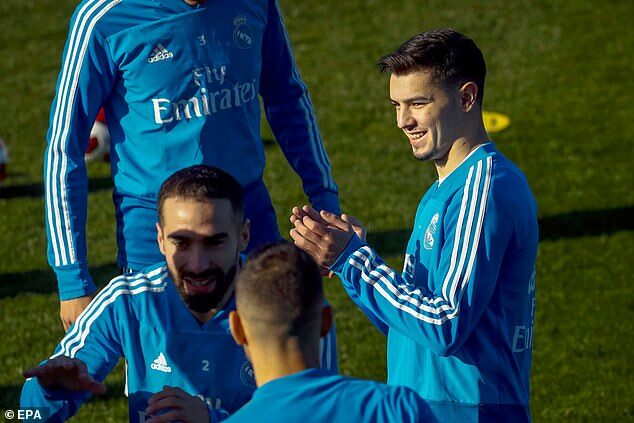 Vinicius was among the Real stars pictured in training in the January sunshine, along with Luka Modric, Isco, Marcelo and others. Diaz could get a chance if manager Santiago Solari wants to switch things up, with Real making an inauspicious restart after the winter break. They drew 2-2 at Villarreal on January 3, before being beaten 2-0 at home by Real Sociedad on Sunday. They host Leganes in the Copa del Rey on Wednesday before visiting Real Betis in the league at the weekend. Real are currently fifth in La Liga, 10 points behind leaders and rivals Barcelona.